What dog owner hasn’t done this? You anthropomorphize your four-legged friend, put thoughts and feelings into his or her head that he or she almost certainly doesn’t have, and basically turn your pet into a four-legged person. That is exactly how photographer Sandra Müller feels about her dog Maja—who inspired Dog People—the book that provides hilarious and creative photographic answers to the question: “What kind of person would this dog be?” Whether it’s Great Dane Holly as a couch potato or “Gismo” riding a Harley, these images and more make up the unforgettable and endearing collection of portraits of man’s best friend in Dog People. From the author’s foreword: “No, this book is not meant to be a fashion show for dogs and dog owners—dogs are not dolls and should only have clothes put on them when medically necessary. 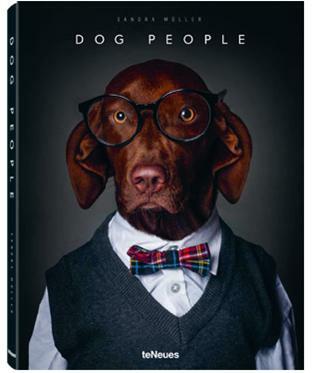 This book is simply a thought experiment: what kind of person would my dog be? Let’s be honest: who hasn’t given his or her dog a lengthy explanation of which the dog seems to listen intently and surely seems to understand every word? Yes, yes, I know… YOUR dog understands every word, just like mine!” The book is a colorful parade of dogs, from Giant Schnauzers to Pugs, from registered purebreds to street mutts. There is also a humorous description of each dog explaining how the outfit was chosen to make the particular animal a Dog Man or Dog Lady. For example, take “Gisbert,” a Pug who would surely be a doctor if he were human—as he loves his vet so much that all you have to do is say: “Dr. Uwe” and he pricks his ears—as much as any Pug can prick his ears, at least.